Wow, didn’t see that coming. The other day I posted that ThinkGeek’s April Fool’s joke tie should be a real product. It turns out that thousands of folks had the same idea. Now it turns out that ThinkGeek is giving the public what they want. 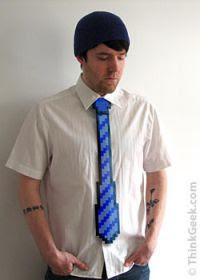 As Laughing Squid points out, the company has decided to make a real tie based on the concept. Interestingly, the price has gone up from $15 to $20. I guess there’s a $5 premium on making dreams come true.